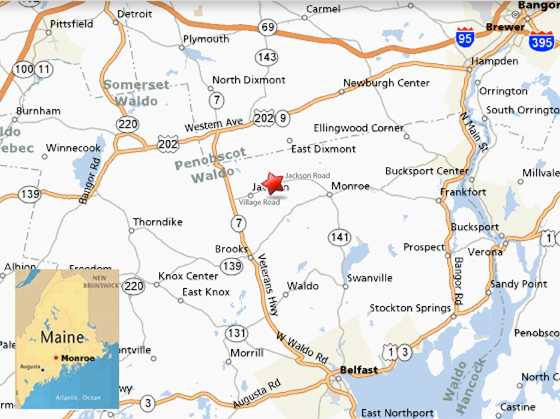 We are 35 minutes driving time southwest of Bangor and its international airport, 2 hours northeast of Portland and its airport, 4 hours northeast of Boston and a beautiful 20 minute drive from the Maine Coast at Belfast. Take exit 113 just North of Augusta - toward Rt. 3 /202/9 and Belfast. 202/9 will exit to your left. Take 202/9 through Unity, Knox etc. until you come to a blinking light and rte. 7. Go right on rte. 7 which will take you over Dixmont Mountain. As the road levels, take a left onto the Village Rd. by a small white church. The farm and studios are exactly 3 miles down the village Rd. which becomes the Jackson Rd. just before it noticably turns to dirt. A yellow mailbox with the numbers 941 is directly in front of the studios. The farm house is diagonally across the street. Turn left (south) on 7 and go about 7 miles to the village Road on the left by a small white church. We are exactly 3 miles down the village Rd. which turns into the Jackson Rd. right after it turns to dirt. The large studios are on the right behind a yellow mailbox with the numbers 941 and the house is diagonally across the street. At the blinking light in Brooks continue on Rte. 7 for aprox 4 miles. Take a right onto the Village Rd. by a small white church. Fly into Bangor, Portland or Boston. :: From Bangor :: - take Brad's Taxi 207-941-9695, 35 minutes to the Farm and Studios. Bring enclosed directions for the driver. :: From Portland :: - take Midcoast limo service 1-800-937-2424 or limo@midcoast.com from Portland to Belfast center. From Belfast take Belfast Taxi (207-338-294) or Bay Taxi (207-338-1993) to the farm, which is 25 minutes. Bring enclosed directions for the driver. Concord Trailways has service into Belfast from both Portland and Boston . You can also take an Amtrack train from Boston to Portland.